Digital marketing has transformed the ad industry and allows for so many freedoms, it is, in fact, the work of choice when it comes to being a freelancer or digital nomad and leads the way in remote working opportunities. As a marketing professional, I am always excited to see people jump at the opportunities available to them and taking money out of the hands of ad agencies which have so far coasted and produced average and sub-par work and got away with overcharging due to the fact that there was very little competition. As the profession has continued to mature we've seen new disciplines come into play SEO, PPC and even social media marketing have become viable job opportunities. These jobs rely heavily on performance and brands want to see a return on investment or you're out the door. You are rated solely on your output. A fairly infantile discipline in marketing has been that of influencer marketing, the dream job of many a millennial, to act as a minor internet celebrity and getting paid for it but offering no real value. How to find real Influence? Influencer marketing started out very pure, the initial batch were people who were holehartedly commited to a topic or niche and they would spend their own money buying products, trying them, giving their honest opinion and creating content because they enjoyed it, it just happened to make money. When millenials saw that this was a viable "easy money" job they began to try and growth hacks social media platforms and try to leverage their internet fame for cash. Women would consistently post scantily clad images while men would go the prank Instagram comedian route using slapstick humour. Both strategies appealing to the lowest common denominator and attract a large following of users not necessarily users of any means to purchase or will, it was purely a spray and pray approach. These numbers were then sold on to brands as a given and influencers continue to make money with many never producing results. I still think this can be a viable strategy for brands if they can find the right content creators but the industry is saturated with no value wanna be's and is in need of a cleanup as well as deciding on what measured success is when using these strategy. Many take shots at influencers but they wouldn't be doing these things if it wasn't profitable and the blame should be on brands who have seen anecdotyle evidence of success using influencers and assuming all influencers are created equal and its a easy way out instead of actually having to do work. It just seems like no one wants to do actual marketing and is always trying to outsmart the system. These brands that have the bucks to spend on influencers and not feel it are often run by marketing managers with very little technical knowledge and are simply in that position because they know how the play the corporate bureaucratic game and not because of their aptitude for marketing or the merit of their work which is why vanity metrics appeal to them and which they sell on to their bosses, upper management and stakeholders. Its a case of the blind leading the blind. For social media platforms like YouTube and Instagram where most influencers build their audience, they honestly don't care. These influencers help murky the waters on what it takes to be successful with digital appeal and for every failed campaign it pushes brands to opt for these platforms native advertising options instead which is a win for them. Too much attention focuses on successful infleuncer campaigns but not much is made of the ones that fail. Its all a bit cloak and dagger at the moment and if I were a brand I'd be very careful about how I allocate my advertising spend. 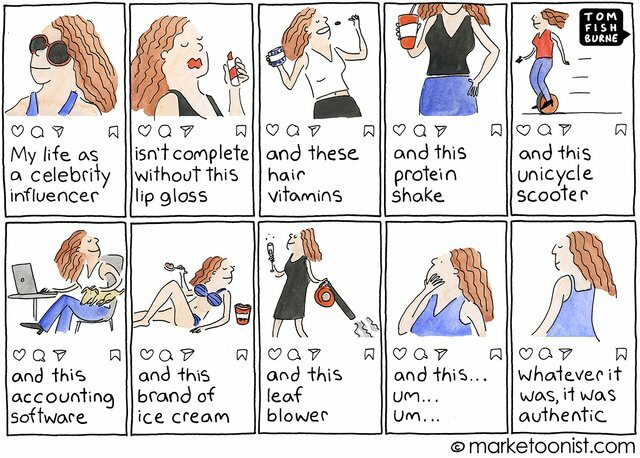 What do you think of influencer marketing? Has it been bastardized into something of no value? Is the gravy train now starting to derail? I don't know if it's a good market strategy. Personally, I don't even care about influencers or the brands they push. I like to think for myself and look at the available choices, before deciding for one. You just got a 4.08% upvote from SteemPlus! Your UA account score is currently 3.835 which ranks you at #4639 across all Steem accounts. Your rank has improved 5 places in the last three days (old rank 4644). In our last Algorithmic Curation Round, consisting of 182 contributions, your post is ranked at #95.